Crossovers Wallpaper: CLAMP Mascots Party Wall! 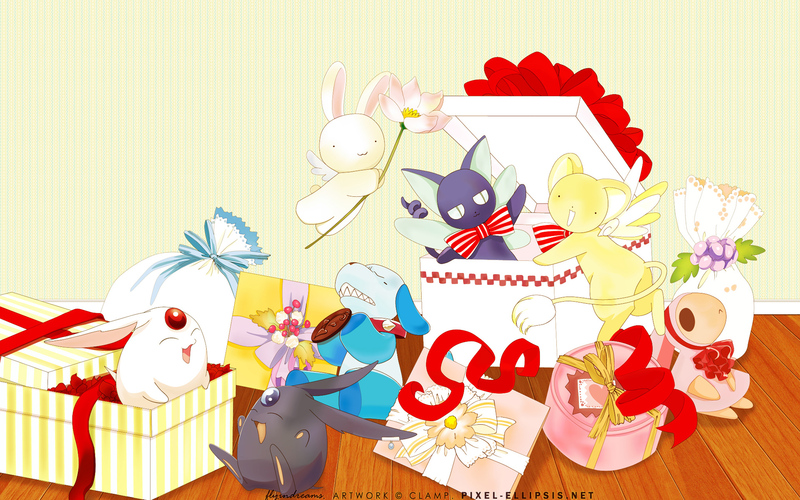 Minitokyo »	Crossovers Wallpapers » Crossovers Wallpaper: CLAMP Mascots Party Wall! Additional res available @ Pixel Ellipsis. So cute and really nice to have all the CLAMP mascots together. Great job using all the different scans to create the design concept. this is so adorable ! you brought all the clamp cuteness love into one piece, very well done, by the beauty of it I can see why it made it into the elite status so quickly. I have to admit it's so cute that it's so going to get faved. from your previous works to present, over all you do excellent work. super pretty! my favorites are the mokona*s and usagi-chan this a very funny and precious vellwall colors and the detail like the boxes are super kawaii! fav! Very cute wallpaper because you can included those famous clamp's mascot together. I'm very impress the artwork that you've done. waah~ this so cute! I love it. Thanks for sharing. Lovely....the color is so sweet as it blends in nicely...! its nicely done!